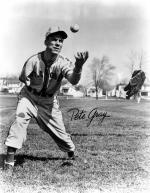 In 1945, Pete Gray played in seventy-seven games for the St. Louis Browns. He collected fifty-one hits, eight for extra bases, and compiled a .218 batting average. As an outfielder, he made 162 put-outs, three assists, and seven errors for a .959 fielding average. On the surface, this may appear an unremarkable record. What the statistics don't tell, however, is that Gray compiled these numbers as the only one-armed man to ever play major league baseball. Most sportswriters and baseball historians credit Gray's professional career to the fact that all of the best players were serving in the U.S. military during World War II. To field teams during the war, major league owners were forced to hire men who were exempted from the draft: older former players, youngsters, and those who received a 4-F status due to some type of disability. Some claimed that the St. Louis Browns purchased Gray as a gate attraction or public-relations ploy to divert the attention of a war-weary nation. Whatever the reason, Gray did not enjoy the whole-hearted respect of his teammates, many of whom believed his presence in the lineup cost the Browns the chance to repeat as American League champions. Born on March 6, 1915, in the Hanover section of Nanticoke, Pennsylvania, Pete Gray was the son of Lithuanian immigrants, Antoinette and Peter Wyshner, Sr. At the age of 6, he lost his right arm in a truck accident. Seven years later, he completed his formal education and went to work as a water boy at the Truesdale Colliery. Determined to realize his dream to play in Yankee Stadium, Pete taught himself to hit and throw left-handed. Once, when asked how he managed this extraordinary maneuver, he explained: "I'd catch the ball in my glove and stick it under the stub of my right arm. Then I'd squeeze the ball out of my glove with my arm and it would roll across my chest and drop to my stomach. The ball would drop right into my hand and my small finger, because it was crooked, prevented it from bouncing away." By the age of 19, Wyshner was skilled enough to play outfield for the Hanover Lits Baseball Club of the Wyoming Valley Anthracite League. Then he played for the semi-professional teams in Pine Grove and Scranton, Pennsylvania, and Brooklyn, New York. To avoid ethnic discrimination and enhance his chances of playing for a professional club, Wyshner changed his surname to "Gray." After failing in tryouts with the St. Louis Cardinals and Philadelphia Athletics, Gray in 1942 signed with the Three Rivers Club of the Canadian-American League. He hit .381, and his exceptional performance captured the attention of the Memphis Chicks, who signed him the following year. Gray's .333 batting average and league-leading sixty-eight stolen bases earned him the Most Valuable Player award of the Southern Association in 1944. His nickname? "One-Armed Wonder." The Philadelphia Sports Writers honored Gray as the "Most Courageous Athlete." But aware of his 4-F status, at a time when thousands of young men were sacrificing their lives on the battlefields of Europe and in the Pacific, the one-armed ballplayer replied: "Boys, I can't fight, and so there is no courage about me. Courage belongs on the battlefield, not on the baseball diamond." In 1945, Gray signed with the St. Louis Browns of the American League for $4,000. He collected his first major league hit (a single) against the Detroit Tigers on April 17, 1945. On May 19 the one-armed rookie realized his boyhood dream of playing in Yankee Stadium, collecting five hits and two RBI as the Browns swept the Yankees. Against the odds, Gray also proved to be an accomplished bunter. In order to bunt, he would plant the knob of the bat against his side. Then he would slide his hand about a third of the way up the shaft of the bat. Fans across the nation adored the one-armed wonder, and turned out in droves to watch him perform. His on-field exploits and relentless fire became an inspiration to disabled servicemen. He did his share for the war effort by visiting army hospitals and rehabilitation centers, speaking with amputees and reassuring them that they too could lead a productive life. As the season progressed, however, it became apparent that Gray could not hit breaking pitches. Once he started his swing, he could not change his timing because he had no second hand to check the swing. It wasn't long before opposing pitchers discovered that fact and fed him a steady diet of curve balls. Gray's major league career ended on V-J Day, when many of baseball's stars returned from the battlefront. From 1946 to 1949, he played on as a journeyman minor leaguer with the Toledo Mud Hens, Elmira Pioneers and Dallas Stars. Left to wonder if he had made the majors on his playing abilities or because of his one arm, Gray returned home to Nanticoke, where he struggled with gambling and alcohol, and lived in near poverty. The 1986 television-movie A Winner Never Quits and the publication of a biography in 1995 renewed public interest in Gray. And the positive reviews of his life at last restored a sense of integrity to his baseball career before his death on June 30, 2002. Bill Gilbert, They Also Served: Baseball and the Homefront (New York: Crown), 1992. Richard Goldstein, Spartan Seasons: How Baseball Survived the Second World War (New York: Macmillan), 1980. William C Kashatus, "Baseball’s One-Armed Wonder: An Interview with the Late Great, Pete Gray," Pennsylvania Heritage (Spring 2003): 30-37. William C. Kashatus, One-Armed Wonder: Pete Gray, Wartime Baseball, and the American Dream (Jefferson NC: McFarland & Co.), 2001.